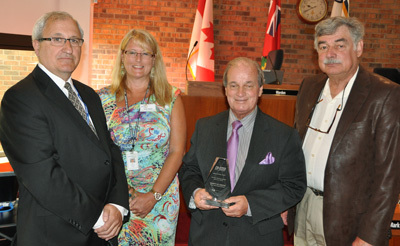 Warden Cal Patterson (centre) of the County of Simcoe, Ontario accepts an E3 Fleet Gold Rating Award in recognition of excellence in the management and green performance of the County’s fleet. The award was made May 27, 2014 by John Lyon (right) of Fleet Challenge Ontario, which works in collaboration with the Fraser Basin Council on the E3 Fleet program. Also pictured are Brian Barkley and Dawn Hipwell (left) of the County of Simcoe. E3 Fleet is Canada's first fleet review and rating program, offering public and private sector organizations the opportunity to identify and achieve energy savings and emissions reductions in their fleets — and be recognized for those accomplishments. Launched by the Fraser Basin Council in 2006 with 17 charter fleets, the E3 Fleet program today has 140 member fleets and over 50,000 vehicles. Are you looking to improve fuel efficiency in your fleet? Reduce emissions? Introduce new fuels or technologies? No matter the nature of your business or size of your fleet, E3 Fleet offers tools and resources to help in meeting your goals, and to better manage expenses too. E3 Fleet Review: a comprehensive, custom assessment of a fleet’s green performance that identifies opportunities for improvement. E3 Fleet Rating: a service that rates fleets on performance and awards high performing fleets a mark of excellence (Platinum, Gold, Silver or Bronze rating) following a points-based review and a third-party audit. You can learn about the benefits of E3 Fleet membership and sign up online — visit www.e3fleet.com. 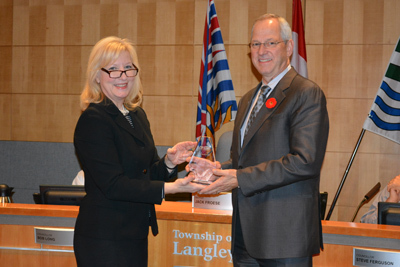 The Township of Langley achieved an E3 Fleet Gold Rating in 2013. Mayor Jack Froese accepted the award from GVSS Senior Regional Manager Marion Town on October 28, 2013. The Corporation of Delta earned its E3 Fleet Gold Rating in 2009. Delta cut emissions in its municipal fleet dramatically, even as the demand for service increased. Fuel efficiency across the fleet increased by 6% for every kilometre travelled, and greenhouse gas emissions dropped 1% overall in a single year. installation of GPS and idling auto shut-offs units for larger vehicles. Delta also introduced biodiesel for its diesel engine vehicles and launched a fleet training program. The City of Vancouver, City of Surrey and Hydro One (Ontario) have also achieved gold ratings.